There are just too many to choose from when it comes to selecting the right crib for the baby. 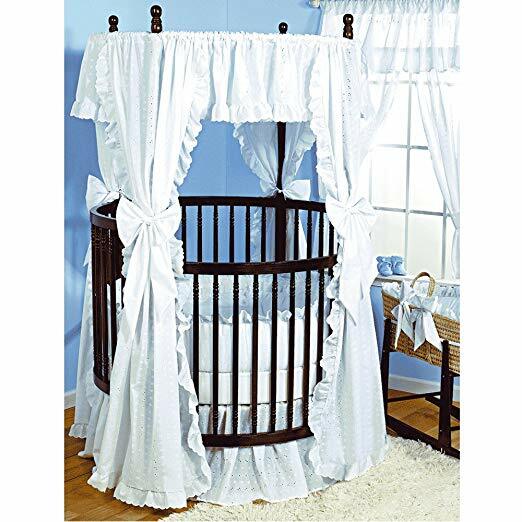 From elegant round baby crib to square, rectangular, oval and even octagon custom-made ones. 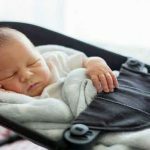 A crib is the ultimate must-have when trying to create a safe and comfortable space for a baby and choosing a circular crib trumps the rest. Here are some of the reasons why many parents choose round baby cribs. 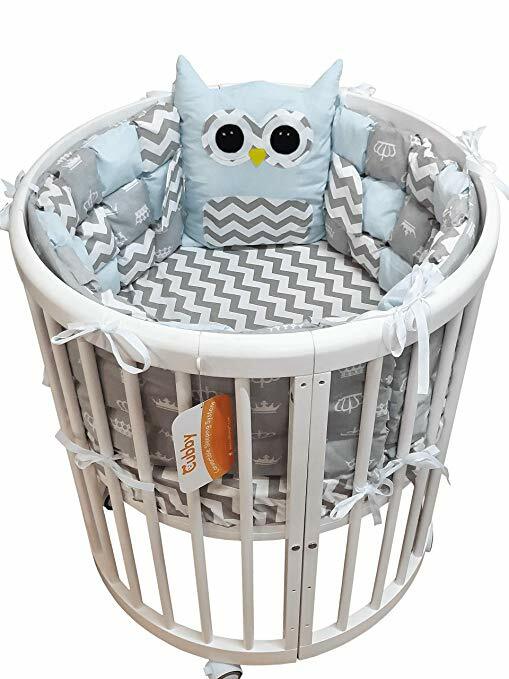 With the growing demand on round cribs for babies, the number of brands saturating the market also increases over time. To give you a head start, we personally handpicked some of the highly recommended ones in the market. To start off your search, this circular crib is surely a sight to behold. 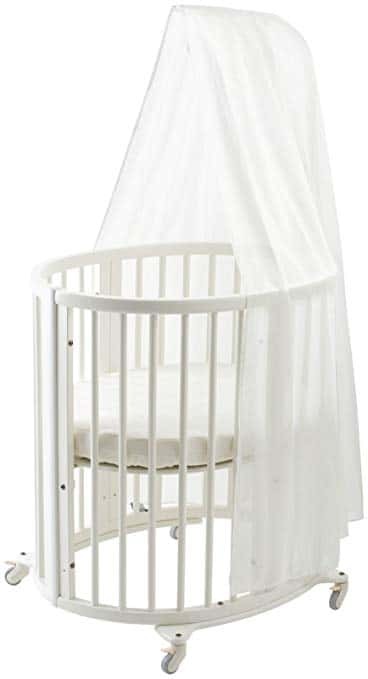 This silver pearl circular crib delivers awe-inspiring elegance giving any nursery a clean-cut, homey-comfy feel–without causing a huge dent to your budget. It features solid wood frame complemented with a canopy frame, 4-position mattress support and non-drop side-rail. It’s also easy to assemble. Check it out here. This is another excellent choice. Also designed to be gender neutral, the exquisite details of the cream and black toile-cotton bedding featuring angelic babies swinging in glee add more drama to the whole ensemble. It features a sturdy circular wood frame and canopy frame complemented with a handy storage shelf below-deck. Each pack comes with a round mattress fitted with white cover including bumpers and then, wrapped up in pleated skirting with ribbonettes. To easily move around, the round baby crib comes with caster wheels. Check out price here. Another exquisite selection in the circular baby crib department. A slide to the oval-shaped kingdom, this elegant crib is as cosy and space-savvy as it can get. It features adjustable height position that allows room for a child to grow in. Practical and comfy, it also comes with a lockable caster wheels for portability and safety. Check out reviews here. This is definitely a perfect representation of its name. Designed for a child to feel like an empress during her infancy. It features a wood frame design for both body and canopy with lockable caster wheels and mesh storage down-under. 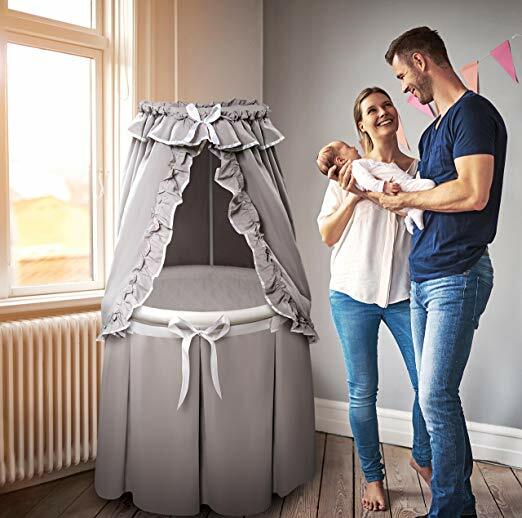 Each pack also comes with a foam mattress, complete bedding set and canopy cover with 3 different colored ribbons to switch the crib’s look from time to time. Great until baby learns to rollover, sit and push up. Check it out here. 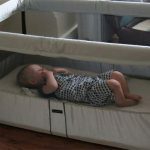 If it’s a rocking crib you want then, the is a highly recommended choice. 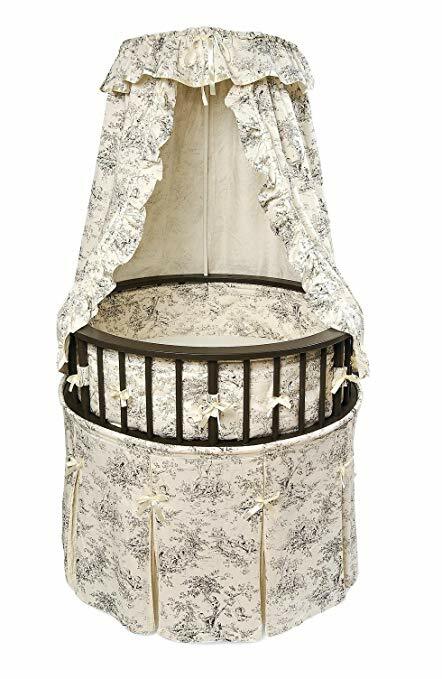 This complete round baby bassinet features a wood-metal combo frame, canopy pole, mesh basket under-storage, and complete bedding set including foam pads, ruffled skirt and canopy cover. To rock baby to sleep, simply flip the wheels up and voila! Baby easily goes to dream land in a few sway. Check out more details here. It’s not only babies that can have circular cribs. 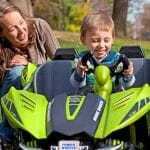 Toddlers and young kids who love to play dolls, too! This is a worthy addition to any household. 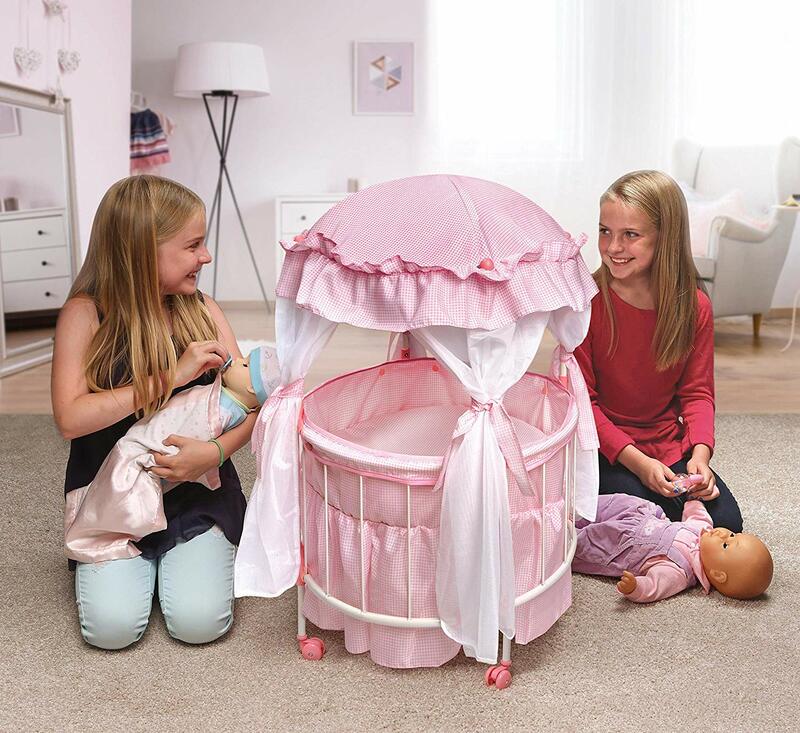 Giving little princesses a taste of elegance in their creative play conquest, this pink-and-white gingham-decorated steel-metal-and-plastic round crib that comes complete with inner liner, padded mat, ruffled skirt and canopy frame with gossamer drapes is definitely divine. Check it out here. Of course, it doesn’t just stop at picking the perfect round baby crib. New parents must also have bedding replacement to ensure good hygiene for your little bun. 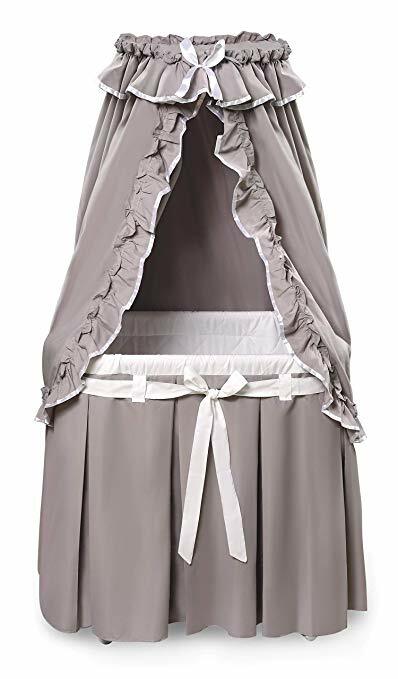 Starting off with the Baby Doll Bedding Sensation Round Crib Bedding Set, this US-made set comes with a warm quilted comforter, bumper, fitted sheet and dusting ruffle skirt. Designed for a luxe nursery, it features translucent gold and cream detailing to spruce up a baby’s space. Materials are made of machine-washable 65 percent polyester and 35 percent cotton making it perfect for baby to stay warm and comfy while ensuring durability to allow it to last for years. Get it here. Another excellent choice is the Angel Line Round Crib Bedding. Featuring a a 5-piece bedding set, this pack comes with finely-embossed fitted sheet, dust ruffle, bumper, comforter and canopy valance with ribbon tie-backs. 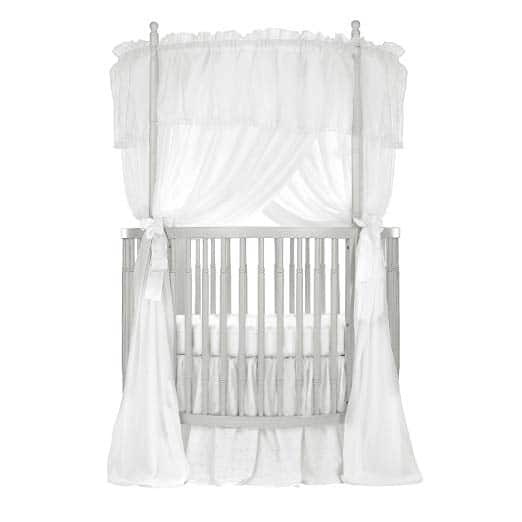 With its ruffled detailing, setting up this set on a circular crib can make any nursery look heavenly. 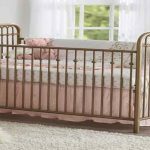 Another polycotton number to spruce up a round crib for baby, the Baby Doll Bedding Carnation Eyelet Round Crib Bedding Set is an elegant creation to spruce up a baby’s space. 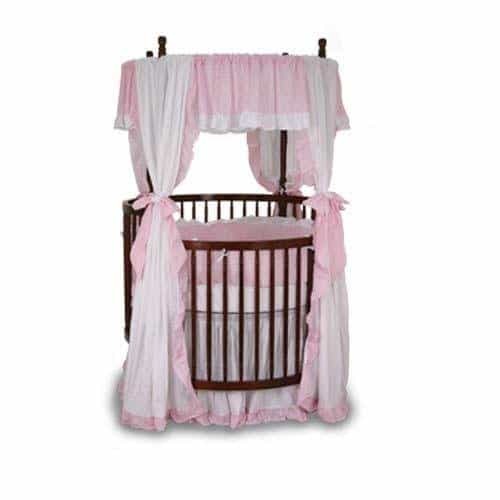 This US-made set comes with a comforter, dust ruffle, fitted sheet, bumper, canopy, drapes and bows. The curtains or drapes can also hold your precious’ photo. Check it out HERE. Last but not the least, this Cubby Baby Nursery Crib Bedding Set Premium is a unique find. Made of all-natural sustainable materials in 100 percent cotton and holo-fiber, this crib bedding set with bumpers is great for babies with known allergies. 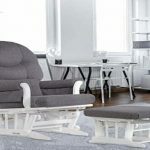 Made of hypoallergenic materials, it offers not just maximum comfort but also safety and warm essential for babies particularly during infancy. Check this out. Babies quickly grow from sleepyheads to little balls of spitfire crawling, pushing or rolling around their personal space. With safety in mind, a round baby crib like the ones above are truly perfect. With astounding features and the right bedding-mattress-bumper set, you will eventually give your little bundle the joy and care he or she deserves.